I’ve always wondered what it would be like to walk on water. That’s all I can think as I walk along the floating plastic pier that extends out of Centara Resort. Since the pier is made up of little independent pieces, the whole 80-meter-long pier undulates with the ocean. The pier moves in waves as the water flexes from the wakes of mooring boats. As I move to shore, I feel like Jesus. Centara is one of those places in Krabi where it looks like the patrons came to Thailand to be at home. That’s to say, there’s nothing special about it. If you changed the color and language of the staff, you could be at any private beach in the world. I guess it’s for people who like their foreign experience in smaller doses. Then again, my foreign experience includes a room with no sink, so maybe they’re doing something right. I’m here to start my PADI certification. I put down a reservation two days ago. It’s a bit more pricey than I’d hoped, but it’s still cheaper than what I’d pay at home. 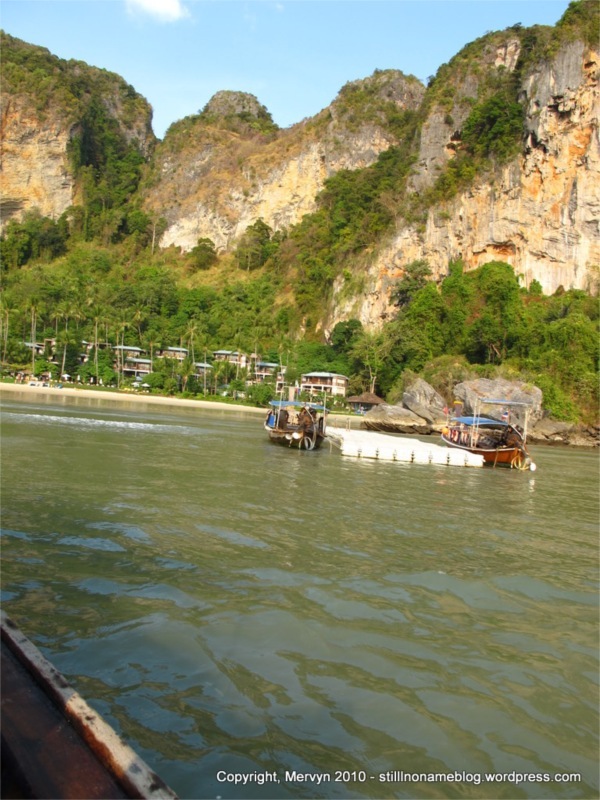 It also includes four dives in the Phi Phi islands. If I did this at home, I’d be in the cold California waters staring at kelp. I consider this a bargain. I’m also overpaying a bit because I think I’m going to have a good experience here. Phranang Divers seems to have professional teachers. I spoke to the owner Kyle on the phone and even though he was a bit monotone, he was helpful answering questions. I figure I’ll only get certified once so it’s worth paying more to be comfortable. I’m not disappointed. My instructor, Dennis, is a Scotsman who’s been living the better part of the last 7 years in Thailand. His wife is Thai. He’s an excellent teacher. We start off at the dive center office. Early on, I discover that they have a nice, western-style bathroom. Throughout the day, I use it as often as I can. I watch videos, learn how to assemble my scuba rig, take tests, and then we’re in the pool. My biggest fear was that I’d have a hard time learning how to clear a flooded scuba mask underwater. It isn’t that bad. The hardest part is staying calm when I feel water in my nose. That wasn’t even that hard. What is hard is learning how to get to neutral buoyancy. That’s where you’re neither floating to the surface nor sinking to the bottom. You just remain suspended in the water. It looks very Zen when Dennis does it, but, when I try, I’m over and under correcting with my BCD and lungs like a teenager driving on a learner’s permit. Dennis assures me that it’s harder in the pool because I keep running into the surface or the bottom. He thinks ocean diving is easier. I’ll have to take his word for it. It’s troubling to me how hard it is to swim the required number of lengths of the pool. It could be that the week in Bangkok has wiped out my cardio. It could also be that the wetsuit is slowing me down. All I know is that it’s harder than I expect, though I make it through fine. Before today, I figured the thing I should be most cautious about, besides being killed by sea creatures, is the dreaded bends. Spending three days with headaches and swollen joints in a cramped decompression chamber sounds horrific. I’m especially fond of my lungs, so I expect to comply. The hardest part of the day is early on when I have to try to disconnect my BCD from my tank. It’s supposed to be easy to release, but I’m a monkey and have fingers like a 6-year-old (not French) girl. We end up spending more time on this than anything else. Dennis is really chill. Since we finish a bit early, he lets me spend some time practicing flooding and clearing my mask. After a few more repetitions, I think I have it down. Overall, the weirdest part is remembering that I can breathe underwater. There are times where I’d snort a little water up my nose. I’d start to cough. Everything was fine though, so long as I clenched my teeth on my regulator and just kept breathing. I’d cough into the regulator, blow water out my nose, and we’d just keep on going. I’m proud to say I never panicked and scrambled for the surface ripping my mask and regulator off looking for air. I’m looking forward to tomorrow. We’re going to take a boat out for two dives. Both will be 12 meters (40 feet). I’m a little apprehensive. The open ocean kinda freaks me out. I have an active imagination and the thought of something swimming out of the deep to swallow me is always in the back of my mind. Dennis says things went well in the pool. He doesn’t seem too worried. I’ll take a cue from him and chill. Stupid Travel Tip of the Day: Get a room with a sink. Not So Stupid Tip: Learn a little bit about football or “soccer” if you’re a guy and plan on talking to other guys on the road. Just knowing something about your country’s own team and learning a tiny about the Euroleagues can go a long way to bridging cultural gaps. I watched Lars and a Swedish guy chat at length about their countrymen’s best players and their respective national leagues. I could participate only because I recognized some names and could talk a bit about the U.S. team’s chances in the World Cup. Alternatively, I haven’t met many people who know much about the NBA, MLB, or NFL. Lebron James, Kobe Bryant, Magic Johnson, and Larry Bird aren’t as big worldwide as the NBA would have you believe. Thanks. It’s a small but significant discovery.